What are bid and construction specifications? After you have determined exactly what you want your uniforms to look like, what you want them made of, and how many you want, it is time to find out how much the manufacturers are going to charge to make them. You accomplish this by soliciting bids. Through this process you let the manufacturers know exactly what you want and they in turn let you know exactly how much it will cost. Prior to this time you will have received BALL PARK pricing to be used during yourbudgeting sessions, but before you can receive an exact quote you have to tell the companies exactly what you want. 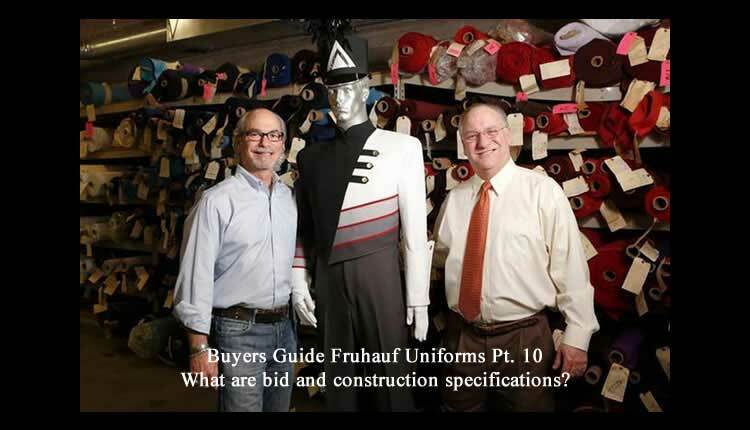 Your Fruhauf representative will be happy to prepare bid specifications for you. These specifications must outline indetail exactly what you want your uniform to look like AND exactly how the garment is to be constructed. As mentionedearlier, all companies can make uniforms that look very similar, however, the way they accomplish this is as differentas a Cadillac is from a Yugo, they can both make a white car but they aren’t the same. Your bid request must stipulateexactly what you expect so that pricing can be figured as accurately as possible. Your bid packet consists of essentially two different parts, construction specifications and styling specifications. Let’s look at each individually. Who should prepare my specifications? What is the proper way to evaluate a uniform? How does braid and ornamentation affect pricing?